Stock market investment is the fastest way of generating wealth. You can double your money in just one month by doing stock market investment. Getting Confused? Well, today I am going to share details about 5 mid cap and small cap stocks that doubled investor money in one month. Stock Market is declining since past one month. Large cap stocks are declining, however, many mid-cap and small-cap stocks are growing exponentially. Many mutual funds company are making investments in small cap and mid cap stocks. It is the prime reason of an increase in these stock price. Upcoming economic reform and GST bill will further boost these stocks. 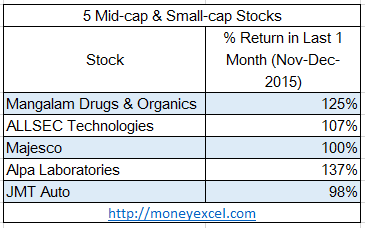 So, here is 5 mid-cap and small-cap stocks that doubled investor money in just one month. Mangalam Drugs & Organics stock has given 125% return in just one month. The reason of the increase in stock price is due to fresh investment made by big fund house in this stock. Last quarter result of this stock is very good. Profit margin and revenue of company is increased. This stock is now overpriced right now and you should avoid buying this stock at current price. Allsec Technologies is IT Sector Company. Allsec Technologies stock has given magnificent 107% return in one month. The main reason of the increase in stock price is an improvement in the quarterly result and upcoming digital India initiative. Recently stock was able to touch all time high level 157 Rs. You should avoid fresh buying in this stock. If you are holding this stock, it is recommended to earn some profit by selling this stock. Mejeso has given 100% return in one month. Mejeso is IT Sector Company. It is a subsidiary company of Mastek Limited. This company is formulated after the demerger of Insurance business. Apart from this Mastek recently purchased Indigo Blue that will give additional advantage to Majeso. Current stock price is in the range of 650 Rs. You can plan to invest in this stock with target price of 900 Rs. Alpa Laboratories is next in the list. Alpa Laboratories stock was able to deliver 139% return in one month. 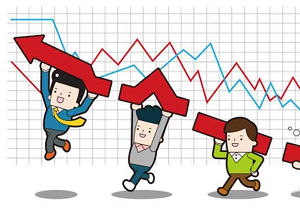 Prime reason of the increase in stock price is the improvement in company’s performance. Earlier this company was making losses, but now it is recovered and started earning good profit. Last quarter report says that company has set a target of 20% growth by 2017. JMT Auto is a small auto company involved in the manufacturing of transmission gears, shafts, bushes and pin. JMT Auto revenue has grown by 36% in the year ended March. Net profit margin is also improved. A company is expecting new orders this year. Recently the stock has shown very good performance after the announcement of the stock split. as they have grown in number, I think now its risk to bet on any of these stocks? What do you say? Do you see any fuel left for these stocks? ?